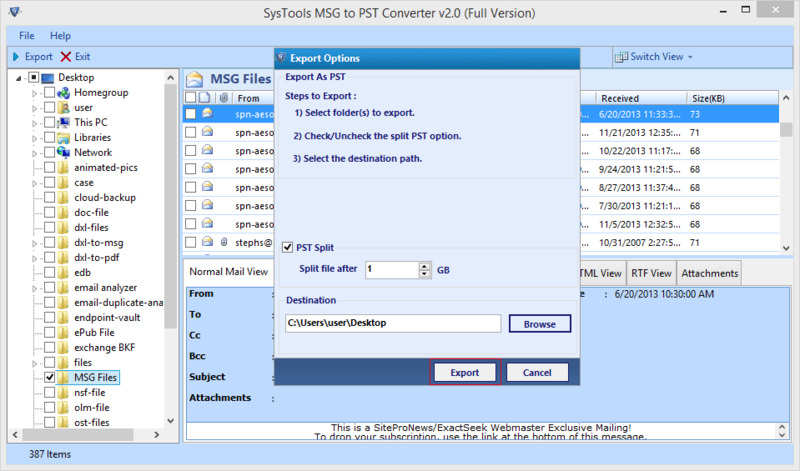 MSG to PST Converter is well-developed software for converting MSG files to PST format in batch mode. 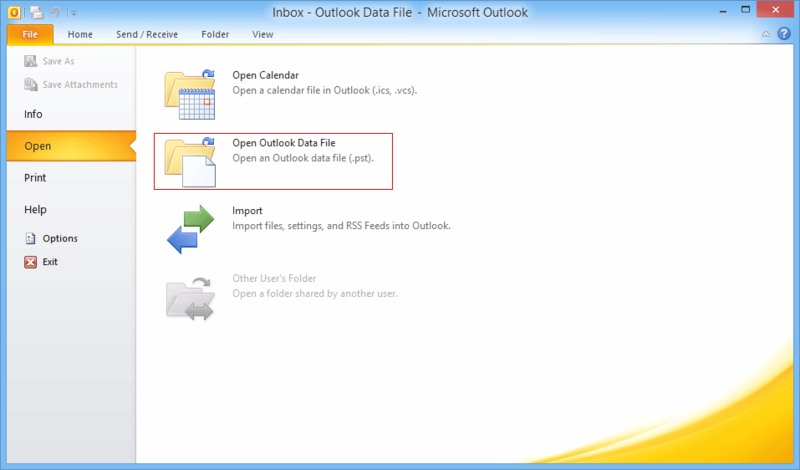 After the migration, these PST files can be accessed in Microsoft Outlook very easily. 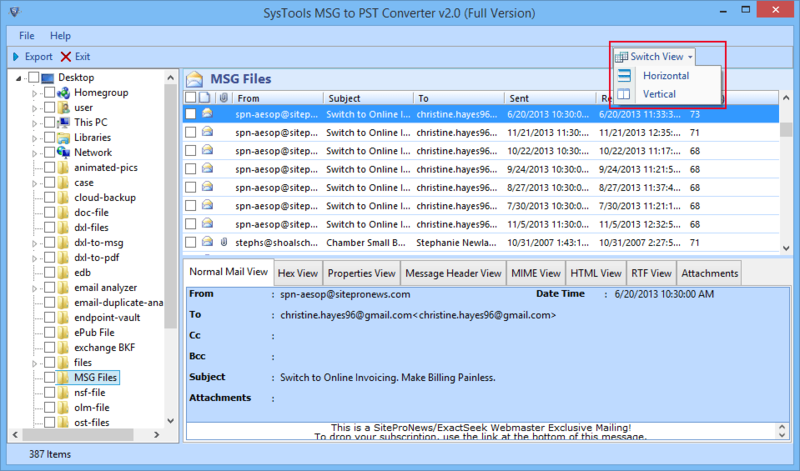 A single PST is generated for all the emails of MSG. Moreover, the tool keeps the Meta properties such as Bcc, To, Cc, date of creation, details of sender, etc. The software allows users to find the location of MSG files in an automatic manner. 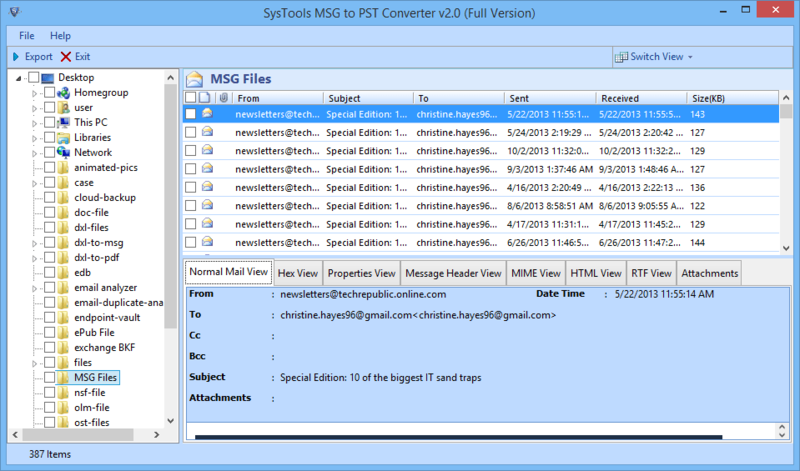 Users can browse folders containing MSG files and the utility loads all the MSG files along with the associated properties. Moreover, the interface of the tool is very simple and easy to understand. Therefore, even a novice can perform the task of migration using this tool. 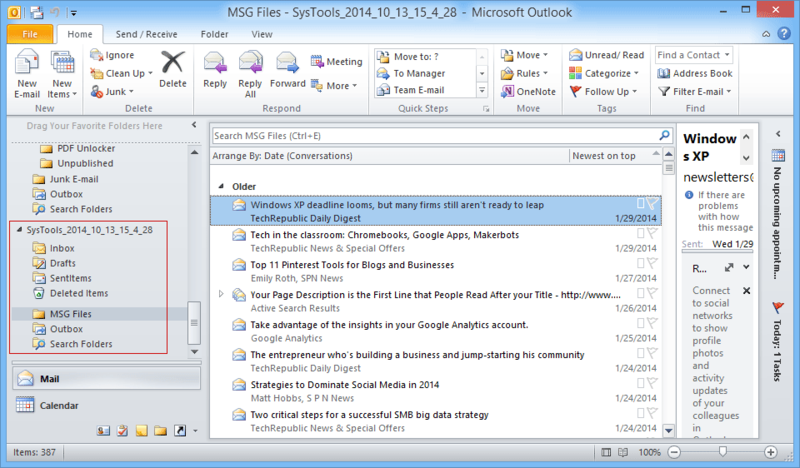 Sometimes users wish to view the MSG files for investigation proposes. In such situations, users can view the MSG data files in different views such as Hex View, Normal View, Property View, MIME view, RTF view, message header view, and associated attachments of emails. All kind of attachments can be viewed with this tool without any difficulty. 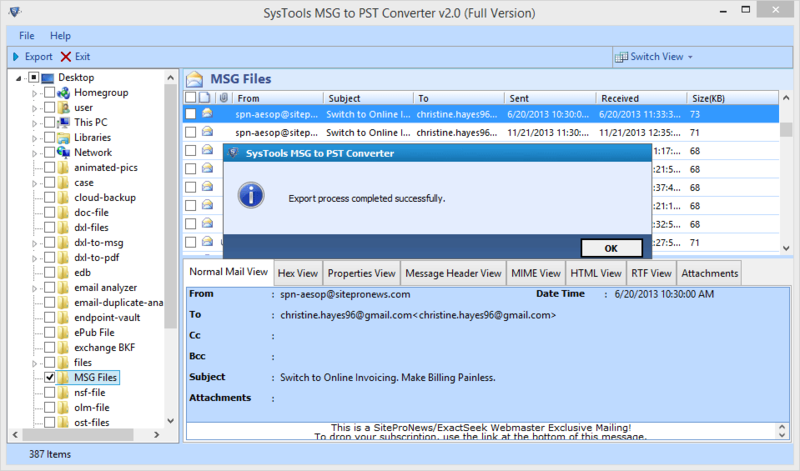 MSG to Outlook PST Exporter tool permits users to select some required emails and convert MSG to PST Outlook. They can even generate an individual PST from chosen MSG files instead of exporting all MSG data files. For this, users just need to mark or unmark the email, which they wish to convert accordingly. Another important features, which is added to the software is that users can break large PST if needed. It is difficult to handle a large PST file and it increases the chances of data corruption. Therefore, with splitting option these situations can be avoided. 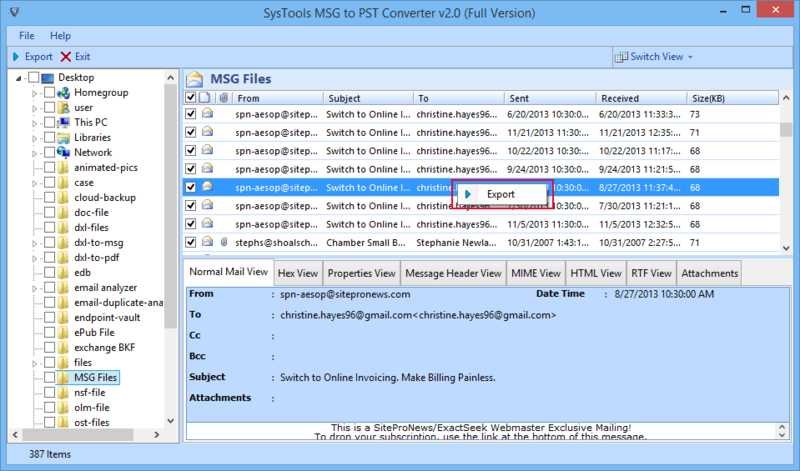 In addition, whole process to import MSG files into Outlook 2010 becomes very easy with this tool. 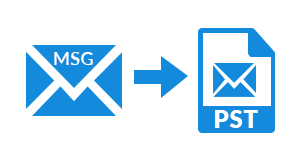 The utility to export MSG to PST loads MSG files along with its attributes such as from, To, sent, subject, Received, & size in KB. In case, users wish to arrange the order again then this sorting feature will be helpful. Apart from this, there is not 2 GB files restriction as the tool creates UNICODE PST and there is also an option to switch the screen as per need. Does MSG to Outlook Converter can perform the migration in bulk? Yes, it is very simple to migrate MSG files to PST format in batch mode. 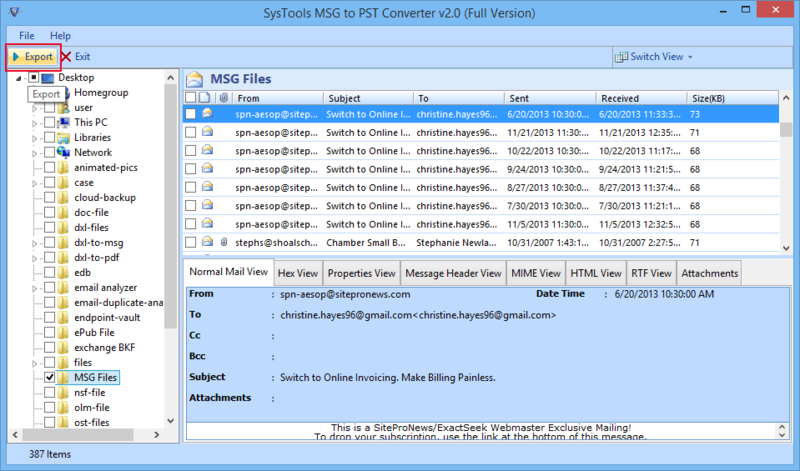 Can I use this software to import MSG files into Outlook 2013? 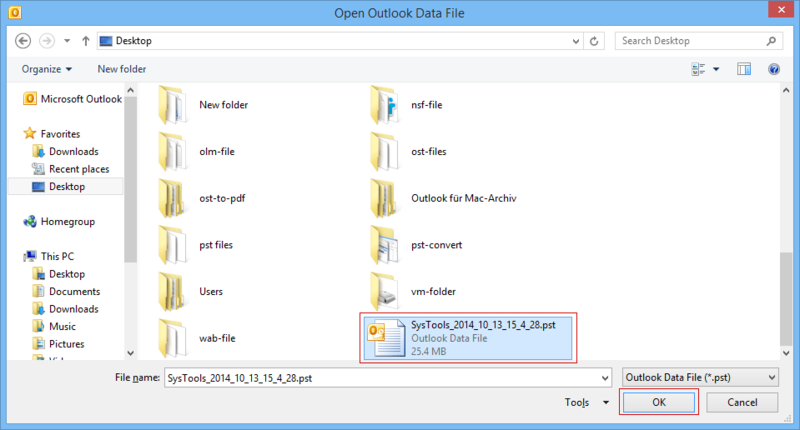 Yes, the tool is capable to move MSG files into any version of Outlook including Outlook 2013, 2010, 2007 etc. Can I use the software in Mac Operating System? No, it is not possible to run this tool in Mac, as it is Windows based utility. Will the utility converts even the corrupted MSG files to PST File format. No, the program cannot transfer damages or corrupted MSG files to Outlook PST. 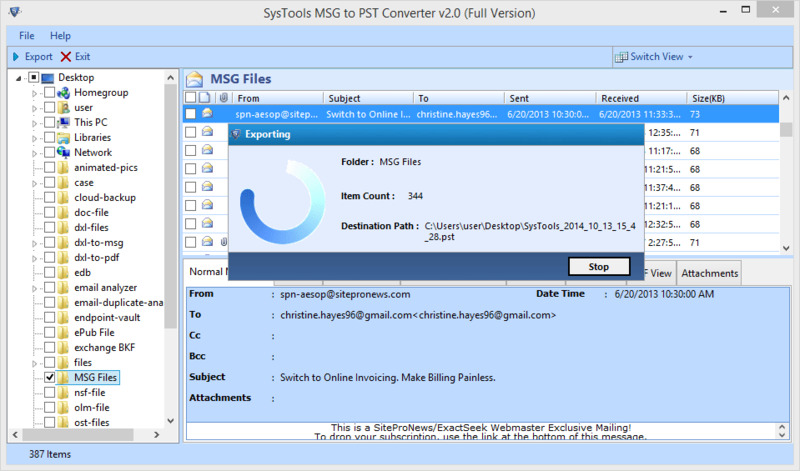 Go to Start >> All Programs>> MSG to PST Converter and Hit on it. The home window of software will open like this. After choosing the files, the tool will display all the emails in Normal Mail View. You can also preview the mails in various manners such as Hexadecimal code, Message Header, Properties View, RTF, HTML, MIME, etc. You can view the attachments by a click on Attachment View. 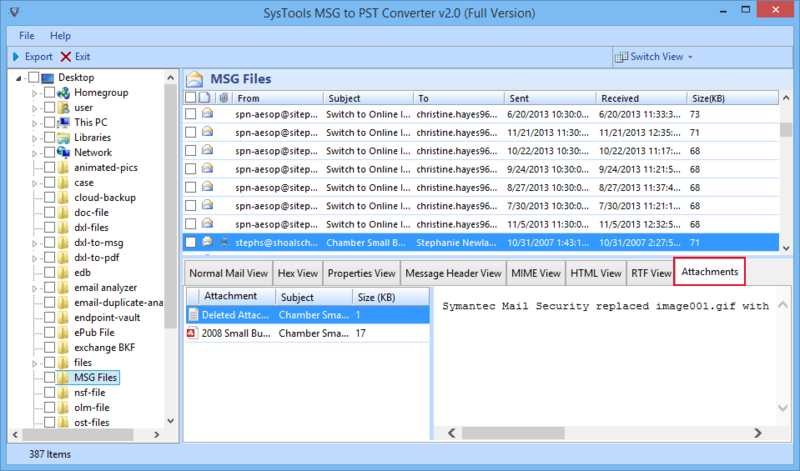 All the MSG files can be viewed in two modes: Horizontal or Vertical View. The screen will be in horizontal view by default, which can be switch later. The software will display Export Options. You may even set a size limit for pst file. After this, browse a location to save the subsequent file. As the as you click on export, the tool begins the show the process report. This report includes Folder Name, Destination Path, and Item Count. 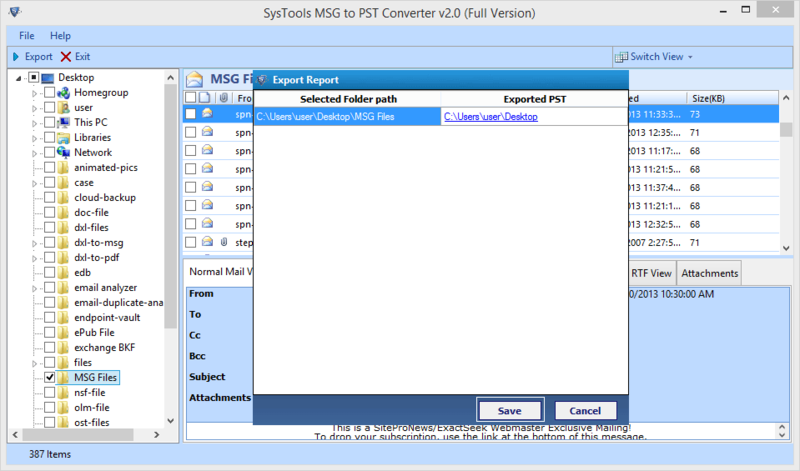 "Converting MSG files to PST format has always been a tough task to me, until I got to know about SoftwarePro MSG to PST Converter. With the help of this utility, I have migrated all my files into PST format at once. The interface of the software is very simple therefore, I encountered no difficulties throughout the whole process." "This tool is a perfect application for migration. 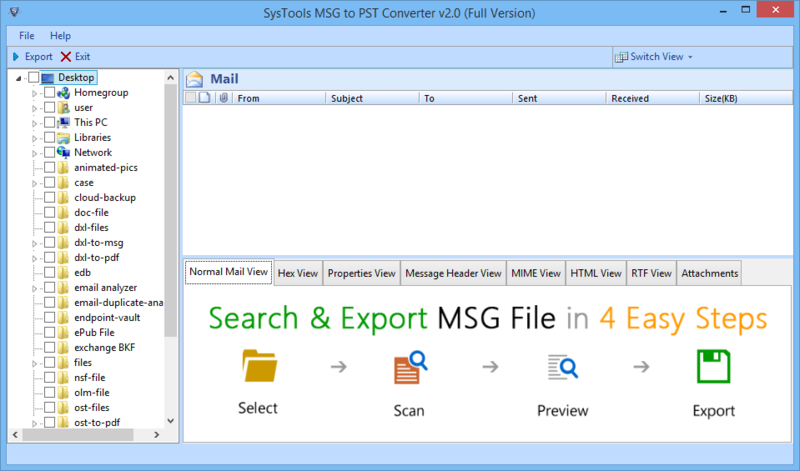 If I focus on the best thing about msg to Outlook Converter software then I would say its capability to move the data in bulk. Moreover, splitting resultant file is also possible with this. I liked the tool very much and suggested it to all my colleagues."